The Portland Trail Blazers fan base has always been a loyal one, but it’s been reinvigorated in recent years by playoff trips in all but two seasons since 2008-2009. Games at the Moda Center provide one of the best home court atmospheres in all of the NBA. The folks in Stumptown love their basketball and Damian Lillard has made sure the Blazers continue to be relevant. Conveniently located in downtown Portland, the Moda Center is calling for you to visit in the near future. The fact that it offers up some of the best food of any arena around the league is the icing on the cake. The Blazers recent run of success has seen some of the ticketing inventory disappear from the primary market, but there are still some seats available from time to time, including for playoff games. When tickets are available, you can buy them online at Ticketmaster, via the phone, or at the Moda Center box office. Sometimes you may want to go to the secondary market for better seats or for tickets to a sold out game. Obviously, you also have the well-known options like Stubhub and NBA Tickets (the Blazers have tickets sold by season ticket holders built into each game’s Ticketmaster page) or a ticket aggregator (a website that aggregates all of the secondary ticket sites except Stubhub) like SeatGeek and ‎TiqIQ, which both have a decent amount of inventory from broker season tickets. The Blazers instituted a dynamic ticket pricing model a few years ago for their single-game tickets. That means the price per ticket is adjusted regularly by the team based on inventory, opponent, day of the week, and the Blazers success on the court at that time. As for where to sit when you go, basketball is a sport best seen in the Lower Level. If you’re looking for some Club amenities with your tickets, you’ll have to buy someone’s season tickets that include Club access because that doesn’t come with anything you’ll buy on Ticketmaster. No longer do the Blazers offer all-inclusive Club Level tickets. Instead each ticket in the Kuni Lexus Club Level offers $30 in food and beverage credit if season ticket holders pay an extra $20. (Make sure to find out what you’re getting if buying Club Level tickets on the secondary market.) Courtside seats come with parking passes, exclusive access to the Courtside Club, and in-seat food and beverage service. The Blazers also partner with the vendor Experience to provide the opportunity for fans to upgrade their seats. Fans can visit the customized Experience website for the Blazers to see what seats are available for upgrades before and during the game. The price decreases as the game goes on, but so does the available inventory as other fans upgrade their seats. It’s the official way to improve your seat during games without having to worry about being kicked out at some point. Fans can also buy experiences like joining the pregame tunnel or shooting post game free throws on the court at an additional cost. 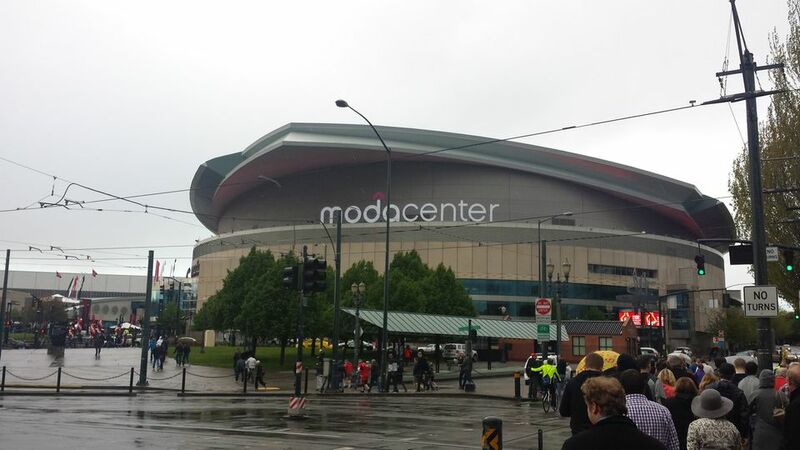 Getting to the Moda Center is incredibly easy because of its location in Portland. All four MAXlight rail lines have stops nearby if you’d like to take public transportation. TriMet buses also provide frequent service to the area around the arena. It’s also a relatively easy walk in less than 30 minutes from downtown Portland or a short taxi ride away. If you decide to drive your own car there are over 2,500 parking spaces available near the Moda Center. The main garage, which contains approximately ½ the spots, is attached to the north side of the arena. Fans can purchase parking passes in advance if they know they’re going to drive. Unfortunately there aren’t many good bar and restaurant right near the Moda Center for you to enjoy yourself before and after the game. The closest place is Dr. Jack’s, located just across from the main entrance. There are plenty of tvs to watch east coast sports on display before tip-off in Portland, plus 12 taps of local beer and grass-fed beef sliders topped with pork belly. The next closest option of note is Upright Brewing, a seven-minute walk just north of the arena. It’s cash only and is closed Mondays through Wednesdays, but you’ll find some nice beer tastings. There's also Spirit of 77 for free pop-a-shot and darts in a huge space if you're looking for more standard pre-game drinks. You’ll find a few food standouts about a 15-minute walk north of Moda Center. The flatbreads, salt cod fritters, and empanadas at Toro Bravo will help fill your stomach. Bunk, a favorite local sandwich chain, has a location in the basement of the Wonder Ballroom and offers up a dynamite tuna melt. Those looking for a fancier meal can grab food at Ox, where skirt steak and lamb chops keep meat eaters happy. Life of Pie Pizza, where you’ll find tangy sauce, chewy crust, and unpredictable toppings, is a little further north. There are options south of the Moda Center as well. Sizzle Pie, Portland’s favorite late-night pizza joint, offers plenty of options for a quick slice of pizza. Burnside Brewing Company gets a little crazy with go-go dancers in the parking lot, but they have a dynamite Sweet Heat wheat ale to go with a cheese-heavy menu. Produce Row Café offers an elevated version of a bacon cheeseburger and some great bourbon. Dig A Pony offers a casual vibe with upscale cocktails. El Pastor tacos at Robo Taco keep local fans coming back time and time again. For the alcohol connoisseurs, House Spirits Distillery has tastings of their pre-Prohibition style Aviation Gin and its small-batch line of Apothecary individual liquors. You’ll also find another Bunk location to get your sandwich fix. Some people chose to come to Moda Center after eating and drinking downtown because there are so many options. Places like the Barrel Room, Dixie Tavern, Kells Irish Bar, and Jones Bar get lively with the after-work or post-game scenes. Everyone who visits Portland hears about Voodoo Doughnuts and I can tell you the lines are incredibly reasonable if you grab one before the game. Blue Plate has the best grilled cheese and tomato soup combo in the city along with mac and cheese that includes bacon. If you’re looking for something heavier, Tabor has all your Czech favorites including goulashes, spaetzles, and a Schnitzelwich, which is a Ciabatta roll including lettuce, paprika spread, sautéed onion, horseradish, and your choice of breaded pork loin or chicken breast. The first thing to do when going to a Trail Blazers game is to download the Trail Blazers’ team app for your cell phone. It has a few nice capabilities like in-seat ordering for those sitting courtside, connect with in-arena beacon technology to prompt you with merchandise discounts and insights about various things on the concourse level, and helps you get to the seat upgrade mobile website mentioned above. Now that you’re settled in with the app, it’s time to dive in to some of the best arena food in the industry. The Moda Center recently went through an upgrade to their concessions, so fans can look forward to some familiar items. Sizzle Pie, previously mentioned as Portland’s favorite late-night pizza joint, is located near sections A15 and A26. There are 35 different choices of slice to choose from and you can get a six-pack of slices at a discount to feed the whole family. They have plenty of vegetarian options as well as a gluten-free version for those looking for something more specific to their diet. Local mini chain Killer Burger near section A5 is also in the mix and you'll be excited when I tell you all of them (yes, all of them) come with bacon. You'll soon realize why Killer Burger has been named best burger in Portland by numerous media outlets. We’ve already mentioned Bunk sandwiches twice, so you know it’s a big thing in Portland. Their stand near section C32 delivers a dynamic pork bell Cuban sandwich. Arena sausages get taken to the next level when you visit the Moda Center. You can still get good soul food even though you’re in the Pacific Northwest thanks to Po' Shines Café De La Soul. Who doesn’t like beignets and creole style sandwiches? All the links come from Zenner's Sausage Company, which has been around Portland since 1927. The bacon and cheddar mixed into the Blazin' Sausage a real winner. For those continuing to look for vegetarian or vegan options, Plum Tasty has you covered. It's a build your own bowl concept that meat eaters can enjoy too once they choose to add grilled flank steak to their bowl. The length of the line may surprise you because there is strong local demand for this concept. And finally we move on to dessert where Salt & Straw permeates the Portland landscape as the best ice cream in town. Your five options for flavors at the Moda Center are pretty standard, but there’s a reason people are lined up down the concourse level for chocolate gooey brownie or snickerdoodle. Portland is known as the #1 craft beer city in America and that’s evident in the arena as well. 70% of the beers poured at the Moda Center are of the craft variety. Widmer, Pyramid, and 10 Barrel are all featured at various concession areas. Finally, there’s a way to keep the kids entertained as well since craft beers aren’t their thing. Kid City in the 300 level by sections C11 to C15 is an interactive play area for children where they can pick up tattoos, play pop-a-shot, make signs, and get kid-friendly food. Parents should just be careful to wash their kids’ hands afterwards because those areas are generally known to be incubators for germs to be passed along. If you make it in from out of town for the game, there are plenty of hotels downtown for you to enjoy. Portland is an easy city go get around, so it’s best to have a downtown base. Every brand name you can think of exists like Courtyard, Marriott, Hilton, and Westin. The Nines (of the Luxury Collection Starwood brand) is the nicest hotel downtown and one that NBA commissioner Adam Silver and some NBA teams stay at when they’re in town. If you want to stay within walking distance to the Verizon Center there’s the Grand Hyatt or the Courtyard. ‎ Trip Advisor can help you find the best hotel for your needs. Alternatively you can look into renting an apartment via AirBNB, VRBO, or HomeAway.